The CadInputQueue.SendCommand and CadInputQueue.SendKeyin methods are easy ways for programmers to automate MicroStation tasks in their VBA macros. One problem that users encounter is how to adjust the Tool settings for a particular command. As it turns out there is a key-in command that can help with that as well. To find the Tool settings key-ins for an individual tool select the tool from the menu. In this example we are using Place Block. With the tool active open the Key-in window and enter the string: set item toolsettings but do not hit Enter. The available toolsettings key-ins for the active tool will be displayed in the far right list box. Those key-ins can be used in your macro with the SendKeyin method to ensure the toolsettings are configured correctly. 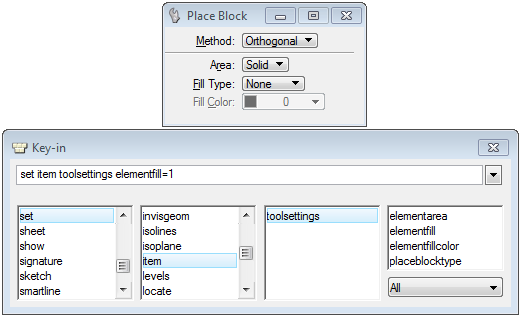 .SendKeyin "set item toolsettings placeblocktype=0"
.SendKeyin "set item toolsettings elementarea=0"
.SendKeyin "set item toolsettings elementfill=1"
.SendKeyin "set item toolsettings elementfillcolor=3"